Jakarta, March 8, 2017 - Today, all industries must be able to transform one of them through the knowledge and use of technology that's suitable for their respective industries. No exception, Financial Services Industry. 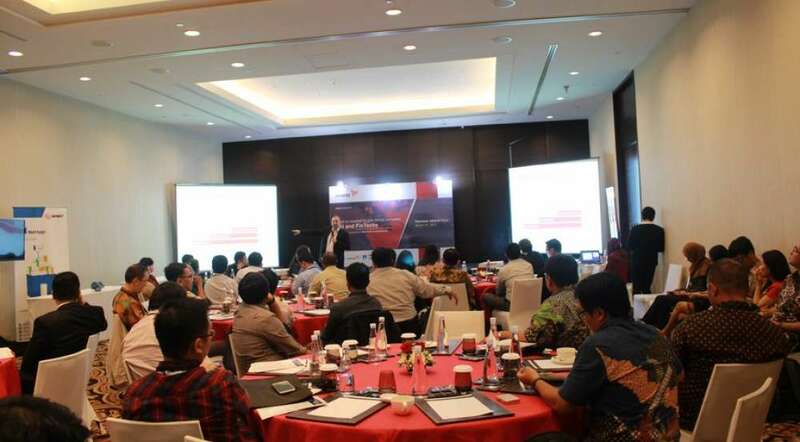 Thus, the SPS via Axway cooperates with Avnet held a workshop for the financial services industry with the theme of what is needed to join forces between FSI and Fintech. Attended by the Vice President, head of IT, CEO, IT managers, supervisors, e-business consultant and others. Opened by Mr. Jimy Chandra as SPS Director for Axway Indonesia with the introduction of how digital business must fight with today technologies. And was continued by Mr. Axel Grosse as Axway Director Presales and API Solution Lead APAC with the main theme what is needed to join forces between FSI and Fintech. Followed presentation by John Martin as a Director of strategy & technology NetApp with mobility initiatives and FSI, and also BCA (Bank Central Asia) was sharing the use of API with Axway for their digital solution by Ms. Heuw Haryanti as VP Group Strategic information technology BCA. All attended also can ask about Axway MFT, API, and Avnet by the discussion panel. With this event, Participants can find out a breakthrough in engagement platform that can manage any digital data stream and can follow the digital financial world today.